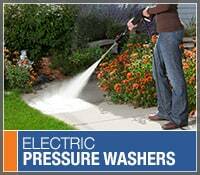 Home » How-To Library » What is a Pressure Washer Water Broom? Dirt, grease, and stains on your garage floor are no match for a water broom. With as many as three or four times the number of spray nozzles, a water broom cleans more surface area with each sweep. And because they have wheels, there's less strain on your back and shoulders, so just about anyone can use it. 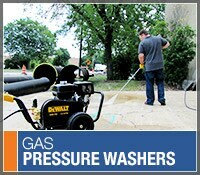 A pressure washer broom enables you to wash away embedded dirt, debris, and stains with more ease and consistency. A water broom is a convenient attachment for your pressure washer that moves debris while simultaneously power washing the surface clean. It splits up the flow of water from your pressure washer into a horizontal line of separate jets, and is used similarly to a push broom. Water brooms make blasting away grime easier than ever. You no longer have to hold up a wand to spray, the wheels on the water broom make pushing it around nearly effortless. The flow of water from the jets are angled forward, and will keep you dry throughout your entire use. Each pass will clean a much larger surface area than your regular pressure washer wand, making cleaning big surface areas much faster and more efficient. And because the spray tips are all spaced the same distance from the surface by the wheels, you know you're getting a consistent clean, minimizing streaks. Looking for Rotating Surface Cleaners? Water brooms are ideal for the average homeowner looking to clean their driveway, walkway, and garage floor quickly and easily. However, for larger surface areas, it may be better to go with a larger attachment like a rotating surface cleaner. What is a Pressure Washer Water Broom?.. Our Power Equipment Direct how-to library can help you learn about Proposition 65 Product Labeling, Sales Tax Information and Product Recalls for Pressure Washer Equipment.